Hackathons are a great way for companies like Facebook or Twitter to get their developers together to find the next great feature. For Y Combinator, it’s a way to find the next developers to add to its incubator. 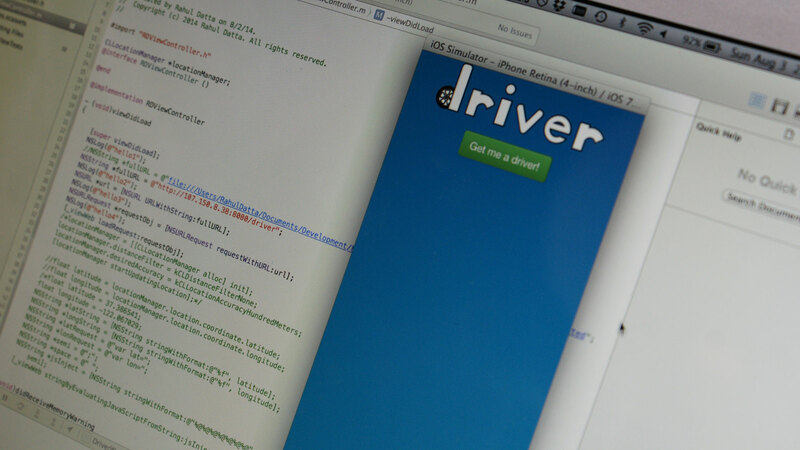 For the developers, it’s a place to build the future via apps and friendships. Y Combinator is in an unremarkable commercial park located in Mountain View. Nestled in the middle of buildings erected in the late 1970s to early 1980s, an orange Y and the meandering developers clutching notebooks (mostly MacBook Pros) are the only signs alerting you that behind the dark wood facade, the new gold rush is going. But instead of panning for gold nuggets in a tranquil stream in the mountains, hundreds of would-be prospectors are are shaking their code in various ways hoping their app, hardware or service will be the next Yo. No one was manning the door when I arrived. This event had actually been going on for 24 hours. There were developers loitering outside, a few in their cars, finishing up projects or catching up with friends. I walked in to a bank of Surface tablets asking me for my registration code (I don’t have one) — and behind them was a pile of name tags. I looked around. No one seemed to be in charge. After 24 hours of developing, everyone seemed energized, but no one was trying to steer me or tell me who I should talk to. So I wandered in and had a peek around. I arrived in time for the hacks — born out of sleep deprivation and too much caffeine — to be judged. It was also time for developers to chat with one another about their “hacks.” In fact, I saw more sharing between developers than judging. I don’t see an actual judge until about an hour into my time here. Noah Goetz, who is behind Driver, an app that checks car service apps Sidecare, Lyft, Uber, and Flywheel and returns the best price and availability, tells me that he’s exhausted. “I slept in the bed of that truck (he points to a VW bus/truck situated in the corner of the room) for a few hours. It was better than nothing I suppose.” He said this with the slight slur of a person who hasn’t had the daily recommended eight hours of sleep. He and his partner are crowded into a space just wide enough for about two laptops. Each of these tables has eight teams all hoping to get the chance to present their idea onstage. Y Combinator dispatched three judges for each group of 25 teams. The three judges then confered on the 25 projects they saw and gave their recommendations to the final judges. Judge Collin Jackson said it took about an hour for them to get through their group. “Each team is visited by three judges during that time,” he says. After deliberations, seven teams were invited onstage to demo their hacks. Nervousness and exhaustion were apparent and it didn’t help that after their demo, the developers were grilled by a panel of judges that included Box CEO Arron Levie, Y Combinator President Sam Altman, Airbnb co-founder Nathan Blecharczyk and Paul Graham. But the real standout was the last demo. 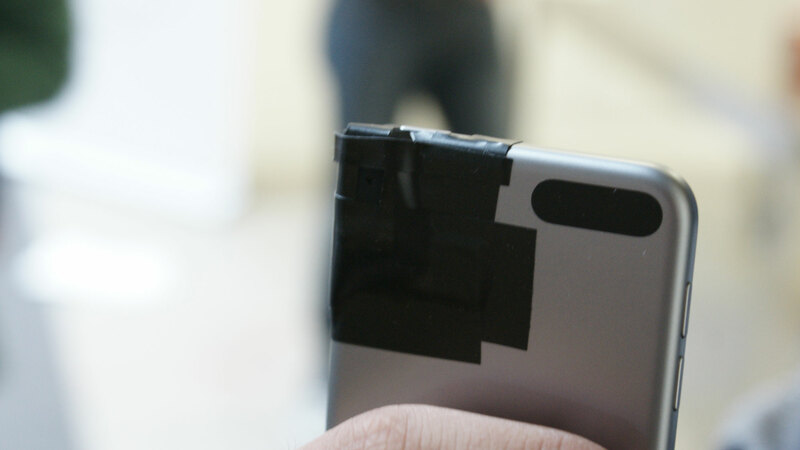 When 17 year-old Cupertino High School student Tanay Tandon brought an iPod touch with a ball lens taped to the device’s lens, a toilet roll and medical slides including one with his own blood on stage, he didn’t have a presentation to project on the screen. 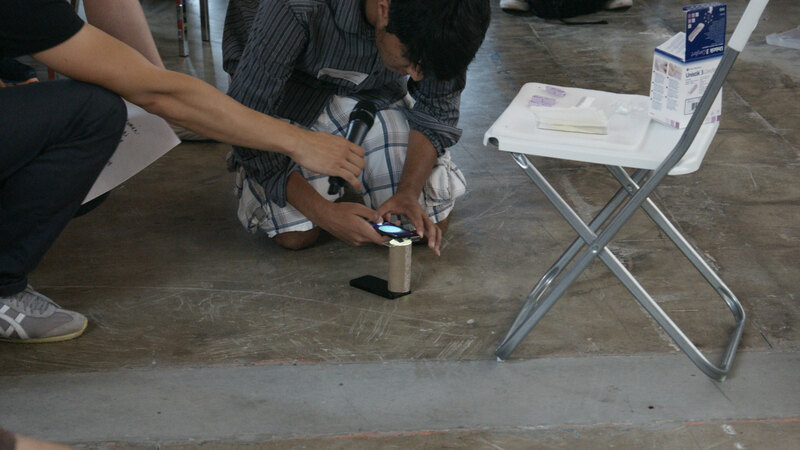 In fact, he ended up demoing his hack on the ground. His app Athelas, uses photos of blood to determine if someone has Malaria. The toilet roll was placed over a light source (an iPhone flash) and used to focus the light. It also acted as a platform for a blood slide to sit upon. He then took a photo with the iPod touch with the ball lens acting as a magnifying glass. The image is sent to a backend that determines if someone is infected by looking at the objects in the photo, in this case red blood cells. If it sees Malaria cells it returns a positive. The backend uses computer vision and AI intelligence to look at the photo and determine the shape of the items presented. Tandon uploaded images of malaria cells so the system knew what to look for. It’s a relatively low-fi solution to a huge problem which is what makes it great. Tandon admits he still needs to do some research, but it’s potentially a life-saving tool that can be deployed anywhere with a $5 lens attachment and the Athelos app. Tandon won the hackathon and now gets an interview with YC. Huge for a high school kid who only got two to three hours of sleep this weekend and spent one-third of his waking hours trying to get that ball lens to line up with the iPod touch lens. He was one of 50 high school students at this weekend’s event. YC Partner Kat Mañalac told me that they’re thinking of holding another Hackathon. “These are exactly the type of people that apply to Y Combinator and who we’ll be working with in two to three years,” she said. But it’s more than what’s happening in the near future. “The under-appreciated benefit of these things is to meet like-minded people that you will start companies with. It’s often less about what you build at this specific hackathon, just that you meet people that you’ll work with for the next 30 years,” said BOX CEO Aaron Levie. Watching the teams interact before and after the event you can see the bonds being made, especially amongst the younger developers. Out of 131 teams, the winner was a lone high school kid whose friend couldn’t make it. But he wasn’t alone. He was surrounded by his peers all congratulating him and peppering him with questions about his app. They were all tired, but it’s doubtful they’ll forget the weekend they spent together and built something.